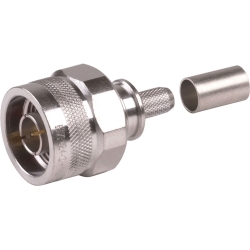 EZ-240-NMH-X (3190-2893) N-Male Times Microwave N Male No-Braid-Trim ADVANTAGE connector for 1/4" LMR-240 foam dielectric cable. No soldering, captivated center pin. Crimp on ferrule with knurled coupling nuts.